IT'S BEEN AWHILE SINCE I'VE DONE A GIVEAWAY, BUT THE WAIT MIGHT HAVE BEEN TOTALLY WORTH IT! I'VE ALWAYS BEEN A FAN OF NET-A-PORTER. THEY CURATE THE BEST OF THE BEST WHEN IT COMES TO FASHION. SHOES, BAGS, CLOTHES, ACCESSORIES, BEAUTY. . .YOU NAME IT, THEY'VE GOT IT! 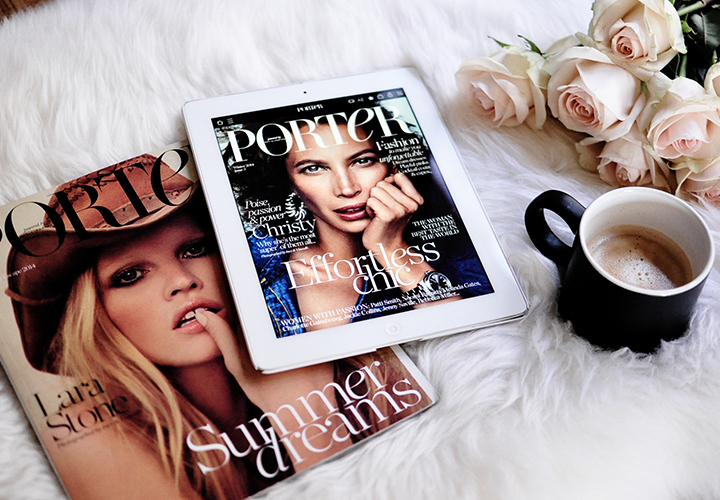 SO, FOR ME, WHEN IT COMES TO SHOPPING ONLINE NET-A-PORTER IS MY "GO TO" DESTINATION. WITH THEIR KNOWLEDGE WITH FASHION & BEAUTY IT ONLY MADE SENSE FOR THEM TO LAUNCH THEIR OWN FASHION MAGAZINE - PORTER MAGAZINE. I MYSELF AM A SUBSCRIBER TO THE PORTER MAGAZINE. WHAT I LOVE BEST ABOUT THIS MAGAZINE IS THAT YOU GET THE BEST OF BOTH WORLDS. THEY ALSO OFFER A COMPLIMENTARY DIGITAL EDITION. I'D HAVE TO SAY I'M A HUGE FAN OF THE DIGITAL VERSION BECAUSE I CAN READ IT ON THE GO. TO OFFER A ONE YEAR SUBSCRIPTION TO A LUCKY READER.